“Leave it,” I reply. It’s Christmas Eve at the Richter house and my brother and I are engaged in our usual holiday ironing negotiations. Every Easter, Thanksgiving and Christmas he paws through his closet to come up with some sort of an outfit that will pass muster (aka meet with my mother’s approval) and every year, on account of his inability to hang his clothes properly, his dress shirts look as though they’ve been through some sort of mummification process. “Nope.” I stand my ground and crack another egg into the bowl of whole-wheat chocolate chip cookie dough I’m whipping up for our Christmas Eve dessert. “But you did it last year!” he protests. On Christmas Day is when we really pull out all the stops. Some families have a lovely home cooked meal, or spend the day visiting aunts and uncles, or—actually, I’m not sure what normal people do on Christmas because at Casa Richter, we load the back of the car up with Two Buck Chuck and head over to New Jersey for a traditional Hibachi dinner. “Richter” is not Japanese. Nor is “Echevarria,” my mother’s maiden name. So why do we eat Japanese food on Christmas? Well, it’s a rather long story and while I wish I could report that it’s because my grandparents honeymooned in Japan or my brother has a particular affinity for chopsticks, it’s simply because Ikko Hibachi Restaurant in Toms River is one of the few BYOB establishments open on Christmas, and intergenerational affairs of this sort require booze. For the record, I appreciate the solemnity of singing “Silent Night”, which is why we separated you two (your father and YOU) this year during the church service. The dogs behaved better than you two did, and yes, folks, there were dogs at the service. Hah! For the record, they were not dogs, they were dogs dressed as sheep for the living Nativity! Your family looks fun. I am glad that you have unusual traditions with very little rhyme or reason. 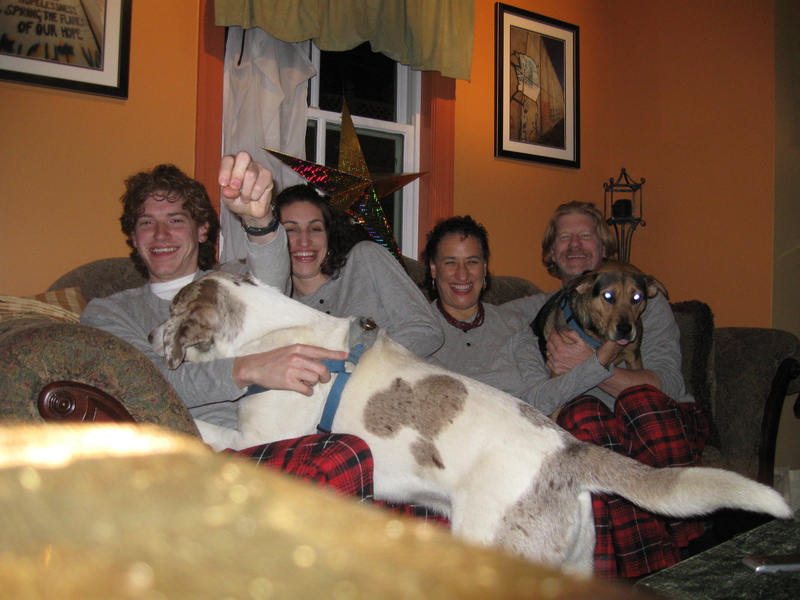 Love those Richter family photos! All barefoot and cozy! Merry merry! And a happy happy! You really have five jobs? Wow, I’m very impressed. Nice to know that my family isn’t the only one that has their own unique Christmas traditions. We spent ours in the movie theater! 🙂 Great pictures! Hmmm. 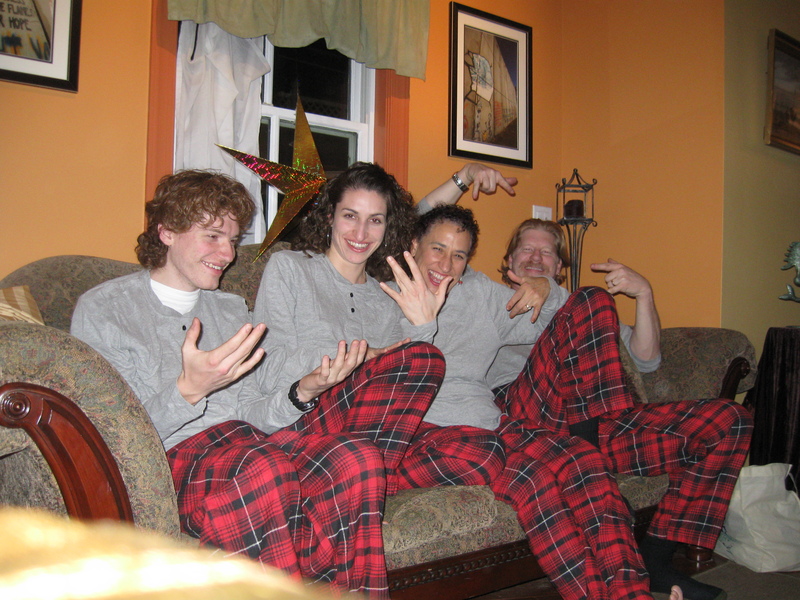 Well, it looks like your brother is just flashing the WTF Gang’s universal sign…. 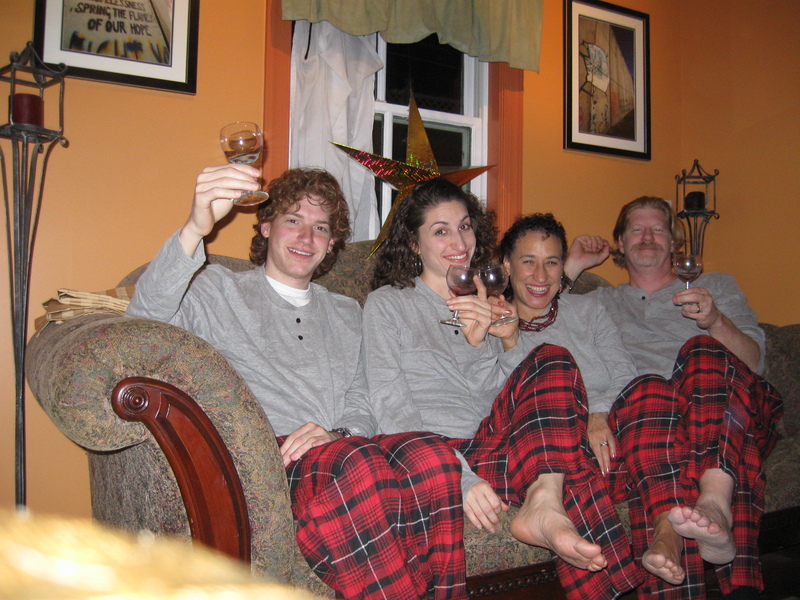 Love the matching pjs! Happy Christmas! How do you actually manage to not get frustrated when you are sorting the washing out? Or do they come with sewed in name tags? To be honest, i think going out for Christmas Lunch is awesome. Less pressure for sure! !